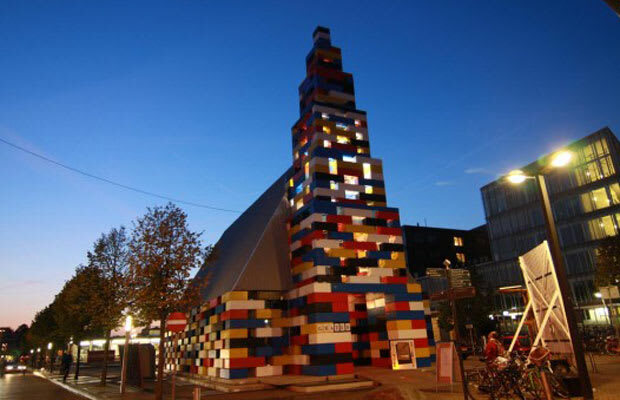 Built to resemble Lego blocks, "Abondantus Gigantus" was designed as a meeting point for the Grenswerk Festival in Enshede, Netherlands. LOOS.FM handled the design, creating a church-like spire. The idea was that the church is a natural community meeting point, so using a traditional architectural style to communicate function was important. Using Lego bricks, LOOS.FM makes a grand, potentially overwhelming structure light, playful, and comprehensible. We think it is pretty cool. The temporary structure is also easily reassembled, thanks to inventive building technique and material.